Okay, maybe a few more warm weather recipes.. although one can make this in the oven, under the broiler. The flavors are yummy with coconut milk, cilantro and lime! 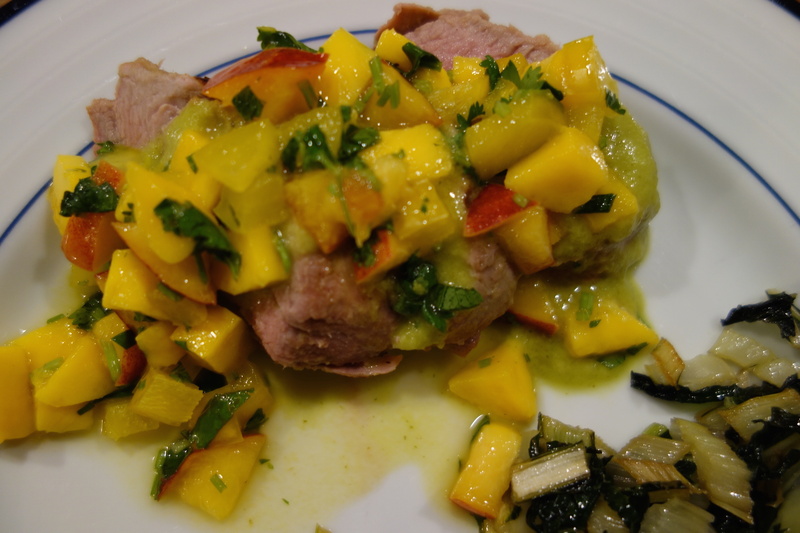 I served it with a summer salsa but go ahead and use whichever fruit is in season… I still see mangos and nectarines in the store…get them while they last! Transfer all the ingredients to a blender and blend till a smooth sauce is formed. Place the tenderloin and the marinade in a zip lock and marinate for 2 to 3 hours. Take out of the marinade and pat dry with some paper towels. Pour the marinade in a saucepan and bring to a boil and keep aside. Grill or cook the tenderloin till it reaches an internal temperature of 145. Let it rest for a good 15 minutes, covered with aluminum foil. Mix all the ingredients in a serving bowl. Check for seasonings and serve on top of the sliced tenderloin. This stew is absolutely delicious. I made my own Jerk sauce and decided to do a stew instead of the normal grilled Jerk chicken. I bought some lovely pork shoulder and got to work. I met a lovely Jamaican family last month and I asked them how what all they add to their Jerk sauce. They gave me the ingredients and I decided to give it a try. I didn’t make it super spicy as I am the only one who enjoys that. I used orange juice and chicken broth for the liquid – which gave the stew amazing flavor. I decided to serve it with creamy polenta and a huge green salad… yum!